I don’t profess to be an expert at toilet training. Like most parents, I’m making things up as I go along! Among my tribe of five I’ve got good sleepers and bad sleepers. Great little eaters and extremely fussy eaters. Kids that compromise and others that are stubborn as mules. Now I only have two children in nappies! The three year old is toilet trained. Hallelujah. Each of the boys made the transition from nappies to undies without much fuss. I don’t possess special toilet training skills. I’ve simply learnt that there’s one crucial thing to successful toilet training. It’s not rocket science. 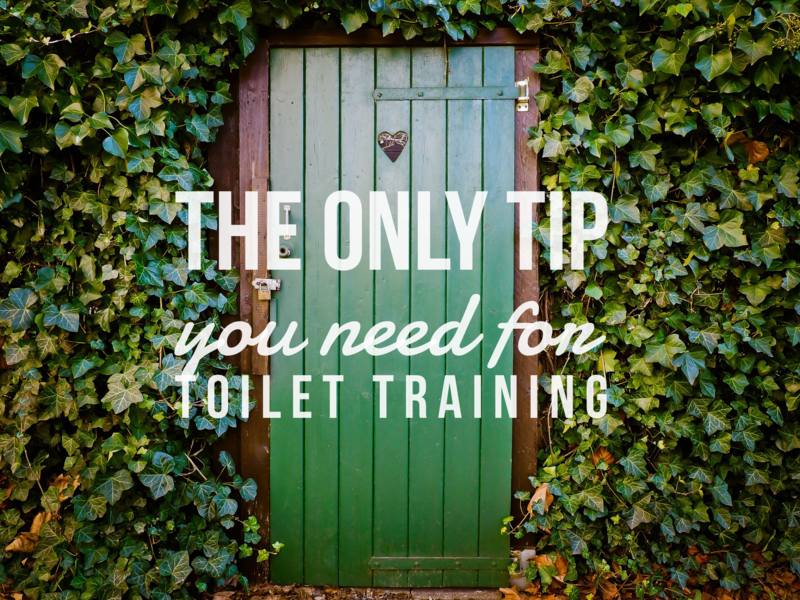 What’s the only tip you need for toilet training? Again, not an expert, not a perfect parent, and every child is different. But having toilet trained three boys, without tearing my hair out, I truly believe the only tip you need for toilet training is to answer a simple question. Is my child ready? A child’s readiness for toilet training will make or break the experience. I’m not saying there won’t be an occasional accident, but if the child is ready it should be straightforward. Now I’ve shared the only tip you need for toilet training, you might be asking yourself, how do I know if my child is ready? Each of my three boys have shown different signs of readiness to ditch nappies. We knew the biggest lad was ready when started shooing us away shortly before he pooed. For a few years we had a house without a bath. The middle lad followed his older brother’s (kinda disgusting) lead and would wee each night in the shower. He clearly had the ability to control his bladder. The littlest lad had started doing the occasional wee and poo on the toilet, but only when he felt like it. He’d probably been ready for a while but we’d delayed because it felt too hard with the twins. Plus, with the extra washing, toilet training in the warmer months is preferable. Every child is ready for toilet training at a different age. There’s some developmental and coordination things that make toilet training easier. Like your child putting on and taking off their own undies and getting on and off the toilet without your help. Those things will make the whole process less painful for you. For what it’s worth, if your child doesn’t adjust to doing their business on the toilet relatively quickly, you can stop. Waiting until they’re ready will make for a happier child. If you are curious, the eldest was out of nappies at about 2 years, 9 months. The middle lad was a similar age. The littlest lad has been the latest at 3 years, 2 months. In fairness he’d probably been ready for a few months and he did ‘get it’ the quickest. My kid is ready, anything else? It might seem like a logical step to move from nappies to ‘pull ups’. For me, the pull up thing seems like a way for nappy companies to keep making money. Pull ups aren’t necessary and tend to confuse your child. I personally think it’s straight from nappies to undies. Some parents like potties. I see the appeal, they are kid sized and portable. But like pull ups, it’s delaying the inevitable. Plus, who wants to clean a potty? So much gross. We’ve always gone straight to the toilet, using a step for them to climb up. We had an insert seat with our eldest but haven’t used it again. Get them onboard with the whole ‘no nappy’ thing. With the eldest we took him shopping for big boy undies and his little seat for the toilet. With the other two, it’s been more about encouraging them to do wees and poos on the toilet like the older brother/s. Be patient and expect accidents, especially on the first few days. The littlest lad had quite a few changes of undies and shorts on the first two days he was nappy free. But day 3, not a single accident. I think he had to get used to the whole ‘no nappy’ thing and the sensation of wet undies. Two and a half weeks later and he’s been almost accident free. Reward their efforts! When the littlest lad started randomly pooping on the toilet I’d be doing happy dances, telling him how clever he was and how I was so proud of him and making sure the whole family knew about it. You’ve got to make them feel special. On day three with the littlest lad I introduced a marshmallow reward system. I told him he could have one marshmallow for a wee and two for a poo. When we went out I packed a little container of marshmallows. The whole marshmallow reward thing worked so well with him, except there were a few times he squeezed out the tiniest drops of wee for a marshmallow. Obviously pick a treat that will motivate your child, smarties are good because they are small. Stickers work with some kids. Pooland is a place you’ll come to love. Other than the middle lad who in the early days would only poo in his nappy at nap and bedtime, we’ve only ever had less than a hand full of poos in undies. But from day one we’ve made a huge fuss about needing to send poo to pooland to be with his poo friends. I know, it’s a bit foul but it seems to work. Once they’ve done a poo we will literally look in the toilet and wave goodbye to the poo before flushing. The littlest lad even says ‘bye poo, go to pooland and meet your friends’. Pooland, it’ll be your friend! Toilet training, has it been a smooth experience with your children? Ever heard of pooland? ← Can I tandem feed in this? Haha one of those things I just don’t envy parents having to go through! It must be a relief when kids are toilet trained though. Oh so many memories of each grandchild (can’t remember the kids!) and toilet training. I am sure they each have their ‘own’ way. You sound like you have done it on an as needs basis appealing the the child concerned. Congrats Claire! This is so true. We had a potty sitting around the place from when Punky was pretty young so she could go and sit on it whenever she wanted, ask questions and it was a good way to talk about the point of using a toilet, and when we felt she was ready we put her in undies and she was god to go, maybe two accidents, and a few weeks later she was ready to lose the night nappy too. Zoe took a bit longer, but mostly because she is an extremely stubborn and inherently lazy kid. Even now she will stand or sit there jogging instead of just getting up and going to the toilet. It was just her personality. And was totally ready, there was no issue with that, it really was just a laziness thing. She was cured of shitting her undies on day one of preschool though, we totally underestimated the power of peer pressure when it came to undie-shitting and she did 3 on the toilet the very first day because she didn’t want to be that kid who pooed her pants, lol! So now we know that potential embarresment is her motivator it’s helped with other things too, lol! I definitely agree with this. Bub was so easy to toilet train because she was ready. I probably could’ve done it a bit sooner but being heavily pregnant then having a newborn I put it in the too hard basket. Turns out it wasn’t too hard afterall. These are great tips and I so agree. Oh gosh, I have to go through this all again, although, first time wasn’t too bad. I wonder if it’ll be different with a girl? Good luck Eva! So far I’ve only toilet trained three boys, I have no idea if a girl would be different. And then sometimes your kids show every sign of readiness and toilet training is a nightmare. I wanted to sell my supposedly ready (by all the information available back in the dark ages) children to someone else who could manage toilet training for me. My son was slightly easier than the girls, but the girls were simply awful. The good news is that at 21, 20 and 17 they’re all good and the boy doesn’t pee on the floor around the loo anymore either.